Deck McGuire was, predictably, a little excited when he took the mound on Wednesday afternoon in New Britain, Conn. Maybe a little too much so. Toronto's No. 4 prospect, a first-rounder on the express track through the system, McGuire started the second game of Double-A New Hampshire's doubleheader and quickly found himself in a bases-loaded jam. "I was just excited to get going, anxious, more than anything, and I guess it showed it in the first inning," he said. "I got behind a couple times, but our pitching coach Pete Walker did a good job calming me down -- so did [catcher] Travis [d'Arnaud]. They just told me to relax, pitch your game and we went from there." McGuire settled in, working around a few hiccups to win his debut, going the distance in a seven-inning game as New Hampshire crushed New Britain, 17-3, on Wednesday evening. The right-hander held the Rock Cats to three runs on nine hits and two walks, striking out six in his first start since leaving the Florida State League, where he ranked fourth on the circuit with a 2.75 ERA. McGuire's escape with the bases juiced in the first removed a bit of the pressure. "I took a deep breath for the first time all day," he laughed. "It was a big relief. And our offense did a great job, so that made me feel pretty comfortable." The Georgia Tech product was the 10th overall pick in the 2010 Draft and impressed the Jays in Florida, going 7-4 with 102 strikeouts in 104 2/3 innings over 19 outings at Class A Advanced Dunedin. He said he was honored when he got the news he'd been promoted. "I was just having a blast in Florida, working on my game," he said. "It's just a great experience, a good chance to get some good experience and I get to watch some of the best arms in our organization go about their business. I'm going to be a sponge and try to soak up and learn as much as I can." 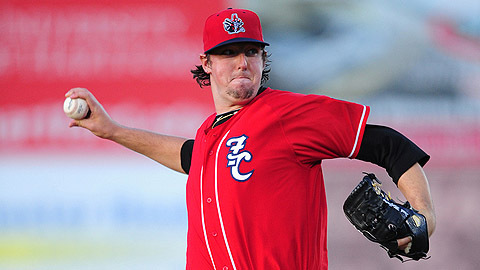 McGuire gave up runs in three straight innings and dealt with runners on base in nearly every frame, including the first, when he struck out Evan Bigley and Nathan Hanson to escape the jam. He worked a 1-2-3 second, but the Rock Cats struck in the third after singles by Brian Dozier and Joe Benson and a wild pitch put runners on the corners for Chris Parmelee, who hit an RBI fielder's choice. The fourth inning played out similarly -- a leadoff double by Nathan Hanson and another wild pitch set up Jair Fernandez for a RBI single. McGuire induced a double play before retiring Dozier to end the frame. McGuire threw another wild pitch in the fifth, but it came after Mike Hollimon's leadoff homer. "I just got myself into a situation, had to throw a fastball with no one on, no outs. I left a fastball up the middle," he said of the homer. McGuire settled down thereafter, retiring nine of the last 10 batters he faced to wrap up the victory. Still, he picked apart his mistakes. "I definitely could have pitched better, I got myself into some spots early, left some pitches up and they made me pay for them," he said. He said the wild pitches weren't a result of working with a new catcher, but rather his attempt to bury a few fastballs out of the zone. "Both times they were fastballs, I tried to keep them down, and I kept them a little too down," he said. Off the mound, McGuire saw his offense get to work with a few touchdowns worth of run support. New Hampshire owned an 11-1 lead by the third and added six more runs in the sixth, thanks in part to a grand slam by McGuire's new batterymate, d'Arnaud. "Any time you get runs, it's a huge relief," he said. "Our guys came out swinging today, they hit the ball all over over the yard, so it takes a little weight off your shoulders." McGuire, who ranked among the leaders in strikeouts while in Florida, said he's already noticed the difference in the hitters up north. "It's just the big difference when they make you pay for every mistake," he said. "Those guys did that too in Florida, but you could get away from it sometimes. But the guys here, even in counts where I didn't need to throw a fastball, they put it in play and hit it hard." Offensively, Mark Sobolewski went 4-for-5 with a homer in the third, finishing a triple short of the cycle after collecting three hits in the first game of Wednesday's twinbill. d'Arnaud finished with five RBIs and also fell a three-bagger shy of the cycle. Bobby Lanigan (6-8) took the loss after surrendering 11 runs -- six earned -- on 14 hits in 2 2/3 innings for New Britain. Mike Hollimon went deep for the Cats, who won the first game, 7-6.